Drying the temporalis fascia graft is often an understated step in tympanomastoid surgery. Different surgeons use different methods to dry the graft. We report a novel method of drying temporalis fascia graft for tympanomastoid surgery using hot boiling water. The method is quick, easy, and safe. Using a dry temporalis fascia graft is still preferred by a majority of surgeons. A dry graft is easier to slide and manipulate beneath the tympanomeatal flap. A number of different ways to dry the harvested fascia have been tried and used by different centers depending on institutional protocols, availability of drying methods, operation theaterset-ups and individual preferences. An ideal method should be one which is quick, free from contamination, non-hazardous, and feasible. It can be placed under a heating lamp set on the back table. This may not be a very practical method in some OTs due to space crunch. Some centers use an air dryer, which carries the risk of the graft being blown away and contamination of the graft. After harvesting the temporalis fascia, it is placed "fascia down" on a small metal plate and the excess connective tissue is removed using an elevator or back of the knife until it forms a thin uniform layer. A small bowl is filled with hot boiling water (which is easily available in an operation theater) and the plate with graft is placed over the bowl. Both the plate and the bowl are gently rocked so that the hot water touches the undersurface of the plate. Within 30 s, the plate becomes hot and graft starts drying. The graft invariably dries completely within 2 min [Figure 1]. It is a quick method of drying the graft with no risk of contaminating or blowing away the graft. It is especially useful for beginners, who may fail in their first attempt to place the graft and need to dry it again. This has been the standard method of drying the temporalis graft at our institute and has worked well for us through the years. We acknowledge the help of our institute Dayanand Medical College and Hospital, Ludhiana (India) for the help and interest rendered in the study. 1. Heermann H. Tympanic membrane plastic with temporal fascia. Hals-Nasen-Ohrenh 1960;9:136. 2. Indorewala S, Pagare R, Aboojiwala S, Barpande S. Dimensional stability of the free fascia grafts: A human study. Laryngoscope 2004;114:543-7. 3. Onal K, Uguz MZ, Kazikdas KC, Gursoy ST, Gokce H. A multivariate analysis of otological, surgical and patient-related factors in determining success in myringoplasty. Clin Otolaryngol 2005;30:115-20. 4. Wormald PJ, Alun-Jones T. Anatomy of the temporalis fascia. J Laryngol Otol 1991;105:522-4. 5. Alkan S, Baylanĉiĉek S, Sözen E, Baŝak T, Dadaŝ B. 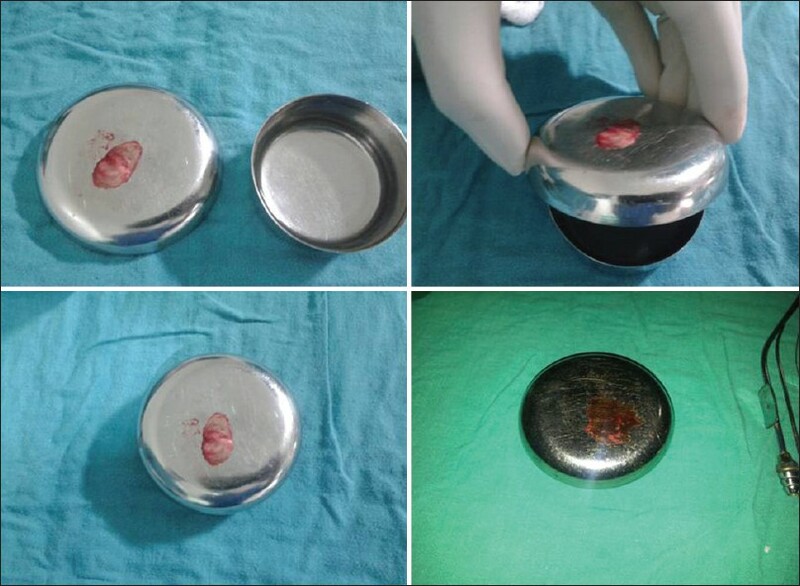 Effect of the use of dry (rigid) or wet (soft) temporal fascia graft on tympanoplasty. J Otolaryngol Head Neck Surg 2009;38:126-32. 6. Spiros Manolidis. Closure of tympanic membrane perforations. In: ME Glasscock, AJ Gulya, editors. Shambaugh surgery of the ear. 5 th Ed. Hamilton: BC Decker; 2003. p. 410. 2 Tympanoplasty: does dry or wet temporalis fascia graft matter?